New ESS Live system available RAM test, it works! Since 2006, the Electronic Vision(s) group is coordinator and member of the FACETS research project. 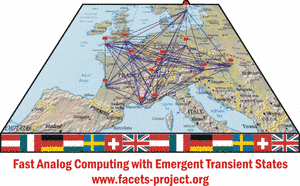 Quoting the official FACETS website, "the goal of the FACETS (Fast Analog Computing with Emergent Transient States) project is to create a theoretical and experimental foundation for the realisation of novel computing paradigms which exploit the concepts experimentally observed in biological nervous systems. The continuous interaction and scientific exchange between biological experiments, computer modelling and hardware emulations within the project provides a unique research infrastructure that will in turn provide an improved insight into the computing principles of the brain. This insight may potentially contribute to an improved understanding of mental disorders in the human brain and help to develop remedies." Together with a team from the TU Dresden, the Electronic Vision(s) group is responsible for the design and building of a neuromorphic hardware. This hardware implements a large number of spiking cortical neuron models, i.e. the electrical behavior of these cells is physically emulated by CMOS circuits. Biologically realistic self-organization mechanisms are implemented in every single synapse. The systems can operate up to 100.000 times faster than their biological antetypes, independent from the number of neurons operated. This scalable high speed makes it worldwide unique and attractive as a tool for statistics-intensive or long-term experiments. An important aspect of the work done in the group is to make this hardware and its accessible to the interdisciplinary community of neuroscience. Therefore, the development of a project-wide unified meta-language and a detailed specification and calibration of the hardware are major focuses. Also within this group, first neuroscientific experiments are designed and conducted which exploit the speed and the self-organization capabilities of the system.